I used to think there were only two kinds of people in the world – those who were creative and those who were not. Until recently, I would have told anyone who asked that I fell squarely into the second camp. I can’t draw, I’m not particularly crafty, I don’t play an instrument, and I can’t dance or sing (well, I think I can sing, but my family begs to differ). While I’ve always liked to write, it wasn’t until I read Elizabeth Gilbert’s Big Magic that I realized that writing is my creative outlet. I guess I never thought I was being creative, because I don’t write fiction, and I didn’t write to be published. Most of the writing I have done over the years has been non-fiction: letters to the editor, essays, recommendation letters, papers, and the like. After reading her book, however, I found that not only is writing my creative outlet, it is a critical piece of who I am. Now that I have actually owned and embraced my creativity, it seems like my whole world has opened up. New possibilities spread out before me, cool people are placed on my path, and inspiration constantly flows in. Want to know the best part? Creativity connects me to Spirit! Automatically! Being in a creative mindset opens up the channel of communication so that it flows both ways. In the short time that I have explored my creative side, I have come to understand that we are ALL creative beings. In fact, I believe that God endowed us with this gift on purpose. Since we are all individuations of Divinity, our lives are expressions of God on Earth. Therefore, my creative acts are the way in which God “exists” in this world, through me. Furthermore, I believe this is the way that God “works” in the world through all of us! Human beings are creative beings by default – we create our lives (whether consciously or unconsciously) each and every day. There was no greater proof of this than the day I gave birth to my first child. I felt like a partner with God in the creation of this little person who had never existed before. At that time, though, I still didn’t believe I was creative…creative in the traditional, artsy-fartsy way we view creativity. The problem is, we have too narrow a definition of creativity. Once we understand what creativity really is, we can unlock that piece of ourselves, allow Inspiration to flow, and enjoy a natural, two-way communication with Spirit. The most traditional definition of creativity is “to bring something new into existence.” Yes, this could be a song, a painting, a book, or a sculpture, but it could also be a newborn baby, an innovative idea, or a new relationship. Dictionary.com describes creativity as “the ability to transcend traditional ideas, rules, patterns, or relationships…and to create meaningful new ideas, forms, methods, and interpretations.” Since we typically view creative projects as tangible “objects,” this second definition expands our perspective to include new ways of thinking, unique insights, or pattern recognition. Ultimately, everything we do is creative. We manifest (bring into existence) all of the circumstances of our lives. The question is, are we purposefully tapping into that innate wellspring of creativity or are we navigating our lives on autopilot? Are we conscious or unconscious creators? I believe that when we acknowledge the creative beings that we are and seek to infuse that creativity in our daily lives, we will find that life becomes more exciting – ideas flow into our awareness, our intuition becomes stronger, decisions become clearer. As Elizabeth Gilbert explains, tapping into your inner creativity becomes an incredibly joyful and fulfilling experience! What’s more, your creative endeavor doesn’t have to be undertaken for any reason other than your own pleasure. Not sure where to start? Try adding color to your life – change up your wardrobe, color-code your file folders. Are you a doodler? Doodle in color. Keep a journal…sing in the shower. When faced with a decision, brainstorm some out-of-the-box solutions. You can even be creative while doing chores – as you load the dishwasher, look for patterns. Fold the laundry and stack the clothes by color. Listen to classical music. Get out in nature. Take a different route home. Anything that shakes up your daily routine will help you disengage the autopilot and get the creative juices flowing! If you once had a creative pursuit that you have since set aside for lack of time or because you were too busy being an “adult,” seriously consider reactivating that childlike playfulness. Even if you can only spare 15 minutes a day…when you open the door just a crack, the Universe will respond! Dig out those knitting needles…start writing that book…blow the cobwebs off your carpentry tools. Or, try something completely new! Sign up for an African drumming class or a culinary course, learn how to kayak, go on a bird-watching excursion. Get a group of friends together to brainstorm solutions to environmental issues. Form a book club and share different opinions on the author’s intent. Engage your inner creative and I promise, you won’t regret it! Creation (or the completion of creation) is the charge the Supreme Being gave us- we are to make this world better each and every day. Some of us have more manifest methods of creation, others are more ambiguous. But, even when we touch another’s soul, the spark of creativity works its way. That is so beautifully put…thanks for sharing! I love this piece! We all are creative, maybe not artistic, but we can all create! Thanks for sharing! Wow, what an awesome awakening. I think I express myself through writing too. Like you, I never really thought much of it as it was a career option (or at least I thought). Right now I’m doing the Ultimate Blog Challenge because I’m changing the course of my blog. The only way I know to do this type of thinking is through writing – thus the challenge. So, it seems that my readers will see my process and growth this month. I love how freeing it is to put my thoughts and inspirations on paper (cyber-paper). I typically post once a week, and since I’m writing a book, I don’t have time to create a new post every day. At first I thought I could repost older blogs during the challenge, but that’s not allowed. But, I’ve enjoyed meeting people like you through the group, and I’m learning a lot by reading the blogs of others! Thanks for stopping by again! Feel the same way creativity is in all of us. Elizabeth Gilbert explained it well. I enjoy doing crafts and find it is time I am totally in the moment and at peace. Glue gun, paint, terra cotta all good. So yes to doing something that brings you joy/peace. Also toss perfectionism out the window and just do it!! 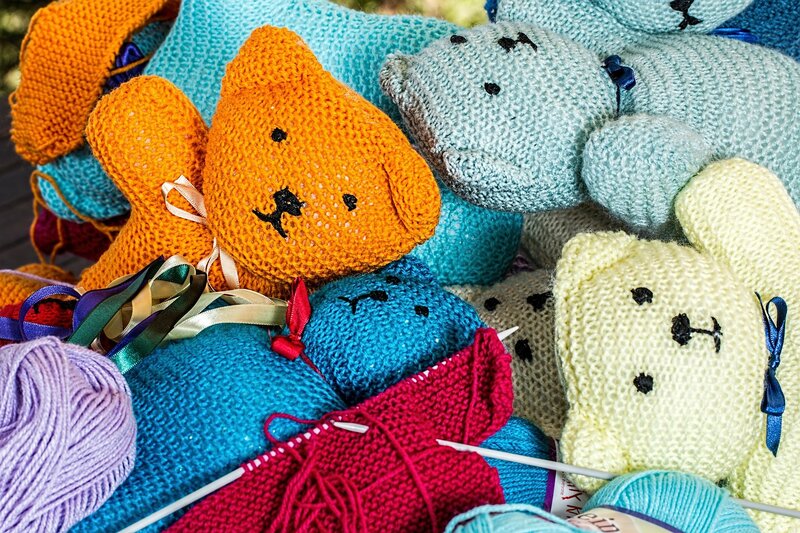 I’m definitely going to look up a pattern for knitted teddy bears, I’ll tell you that! HAH! It’s funny to read about someone else’s “rediscovering their creativity”. When I became a mama, soon after I got downsized out of teaching (Great Recession), my own mother gave me a copy of _The Artist’s Way_, a workbook by Julia Cameron about (re)discovering your creativity; she thought I’d draw or paint or something, which I hadn’t really done since I was in grade school. Instead, I started writing with a fury – and eventually, my blog was born several years later! 🙂 Embrace your creativity for all it’s worth, and YES writing/blogging count!!! Flossie, I’ve heard of that book – it seems like a classic. Maybe I need to check it out! Thank you for sharing your (very similar) story!